Post-ride relaxation. The winding dirt road to 10,000 feet above sea level was tacky this morning, a result of the monsoonal deluge that hit this segment of the Rocky Mountains yesterday. Blast after blast of sulfur in the air, rain pellets pounding the dirt, all afternoon long. Tacky roads equate to perfect traction…you can mash on the pedals, rail away at the handlebars mustering every ounce of energy, and you still won't slip out, even on a single speed with balding tires. A rider can get into the perfect rhythm of the climb, the body and muscles working to bring you ever upward. A globe sits next to me. I inspect it, for the globe is the gateway to adventure for Elaine and I. Today, I investigate the southern hemisphere. An interesting realization – there are zero islands in the Pacific Ocean between 30° south and Antarctica (excluding New Zealand and a few small islands off the coast of Chile). An area the size of Canada and the United States combined with zero lands masses. A bad place to get stuck on a piece of driftwood. I inspect more and find a place worthy of more research. 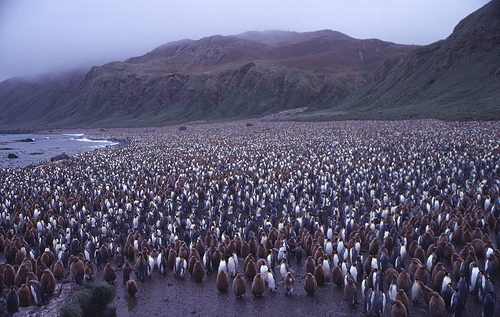 Macquarie Island. Property of Australia, around the 55th parallel south, between New Zealand and Australia. It's worthy of a google search. What is this wild land, Macquarie Island? I didn't know it existed until today. Suddenly I can't get it out of my head. Otherworldly. Like New York City, only with penguins. And I never knew it existed until 15 minutes ago. Elaine and I may never go to Macquerie Island. Then again, anything is possible. But we shoot smaller. A reservation to the yurts high above Lake City, the highest yurts in North America at 12,000 feet above sea level, for a January ski trip. We've never been there either. We don't know what we'll find, and that's exactly what is beautiful about it. Ah, there is nothing like a good storm. I have dreams of storm chasing. As for Macquerie, what are those? Rockhopper penguins? I can’t tell from this vantage point . . . can be deceptively vicious and territorial. 200 feathers per square inch. Funny what I remember from my aquarium days. Love your descriptions. Most evocative. Say hi to Elaine for me!